The PM 301 Flexible Utility Marker is Cable and Pipeline Marker used as a Warning Sign to mark underground utilities such as: Fiber Optic Cable, Gas Pipelines, Petroleum Pipelines, Electric Lines, Water Lines, Sewer Lines and other buried utility Lines. The Flexible Utility Marker can also be used as a Highway Delineator, Boundary Marker or Trail Marker. ProMark’s Flexible Utility Marker is manufactured in the USA from high impact fiberglass reinforced thermoplastic resins. The Marker has a three rib profile design which will flex on impact and return to its original upright position without cracking or splintering. The Marker is designed for the fiber not to come up to the surface which eliminates fiber dust from irritating skin and eyes. Unlike traditional fiberglass markers, the PM 301 is environmentally safe, easy to handle and is 100% recyclable. Standard lengths are 66” and 72” and are available in all standard colors. Custom decals can be installed on both sides of the Marker to meet customer specifications and U.S. Department of Transportation regulations. Installation tools (PM DVR) are available and recommended for easy installation. Pro-Mark is now expanding its Fiberglass Utility Marker for custom markings in city parks, golf courses and hiking trails. The PM-301 Fiberglass Utility Marker is being used to mark holes, trails and landmarks throughout golf courses, local and national parks in the US. Pro-Mark can customize and design decals for the Fiberglass Utility Markers to identify and meet your specifications. The PM-301 Fiberglass Utility Marker comes standard in 66” length and white. 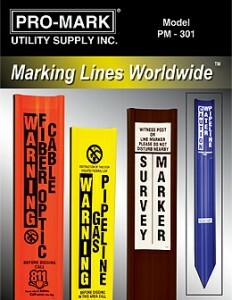 Pro-Mark is the industry leader in manufacturing Marker Posts and specializes in marking lines worldwide.